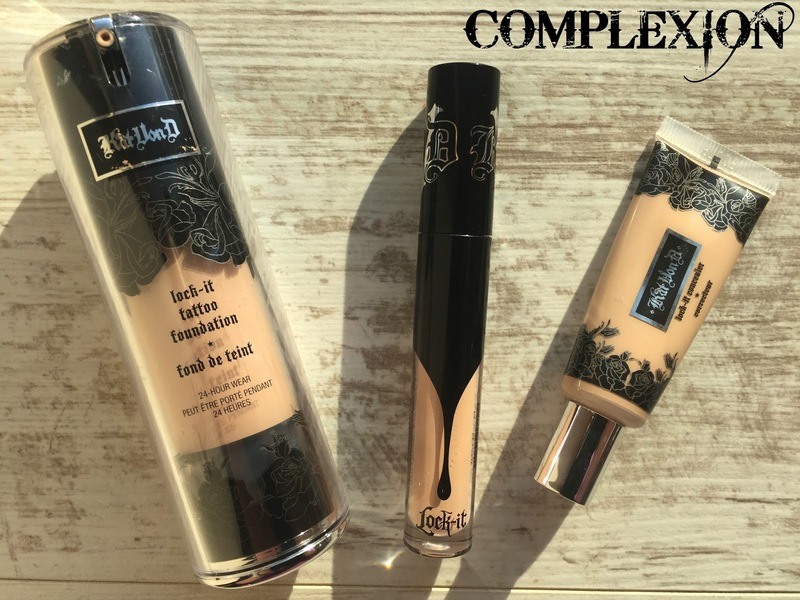 Makeup lovers on this side of the Atlantic rejoiced when the news broke that Kat von D's beauty line, previously exclusive to Sephora in the US, would be stocked in Debenhams for our purchasing pleasure. I have been accumulating her products for the last year or so - every time I or a friend visited the States, there would be a Kat von D pitstop involved somewhere along the line. 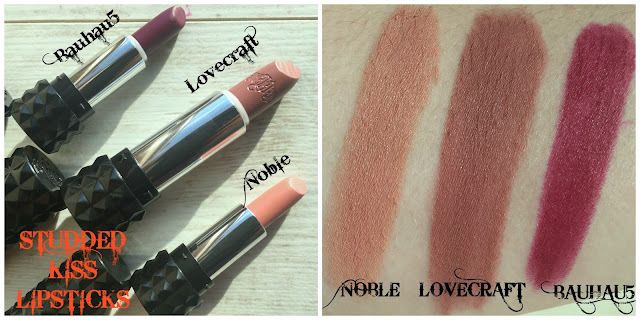 I know that this is a brand that will be very new to a lot of my readers so I thought it would be helpful to give a little round up of what I've liked, loved and loathed in my own Kat von D stash to enable you to make more informed purchases in the coming weeks and months. 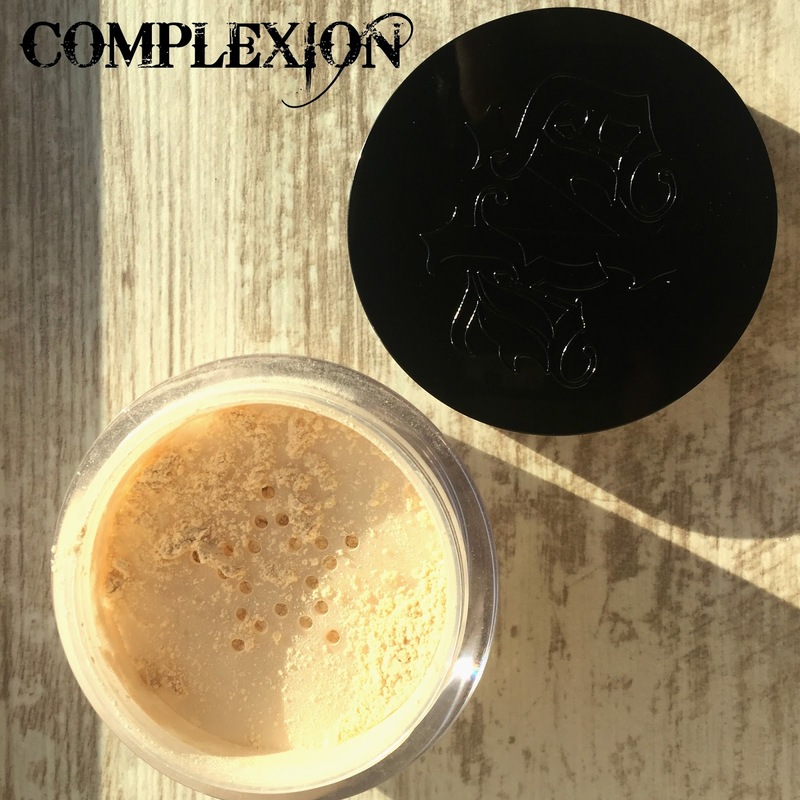 I'll start off with complexion products and of course, the infamous Lock-It range which has earned Kat von D huge praise. I've tried the Lock-It Tattoo foundation, the Lock-It concealer and corrector, the new Lock-It concealer wand and the Lock-It setting powder. 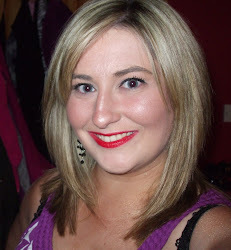 The Lock-It Tattoo Foundation was one of the products I was most excited about trying as I love a full coverage foundation when my skin is looking wretched. I take the shade Light 44 and my usual MAC foundation shade is NW20 for reference. This does give very full coverage and lasts well - I've certainly never tested it out over a 24 hour period but in the 12 or so hours that it has been on my face, it's held up well. I haven't worn this for the last few months as the weather was just too warm to contemplate a full coverage foundation but now that the weather has cooled down somewhat, I'll be looking forward to putting this in rotation again. The Lock-It Concealer and Corrector is a very full coverage concealer/corrector and again, this was another massively hyped up product. I have the shade Light 16. I use this as a concealer for any blemishes or areas of redness on my face - it's a little too thick for my undereye area because I have some fine undereye lines that soak up product like sponges. The trick with this concealer is that a little will go a long way so use sparingly and you should see good results.A more recent purchase of mine has been the new Lock-It Creme Concealer, which unlike the original Concealer and Corrector, comes in a tube with a wand. I've been very pleasantly impressed since I got this and I enjoy the wand as opposed to the tube as it makes it easier to top up my concealer over the course of the day in work etc. This is extremely high coverage and the formula feels a little sheerer than the original Lock-It Concealer and Corrector but it still provides the same level of coverage. I take the shade L13 Cool. I also picked up the Lock-It Setting Powder in Translucent as I am keen to experiment in baking my makeup - I've not tried it for this purpose yet but my first impressions of the product are that it is very finely milled and the colour is a little less ashy than the usual white translucent loose powders available. 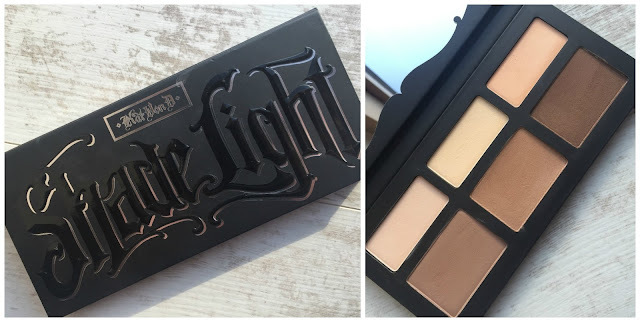 The infamous Shade + Light Contour Palette was probably the product that put Kat von D on my radar first and the first ever product from the line that I got my hands on. I compared it to the Anastasia Beverley Hills Contour Palette in this post wherein I stated that my only quibble with the Shade + Light palette was that the colours were not individually replaceable - as luck would have it, refills for the Shade + Light palette are now available Stateside and I'm sure it's only a matter of time before they become available on this side of the Atlantic too. 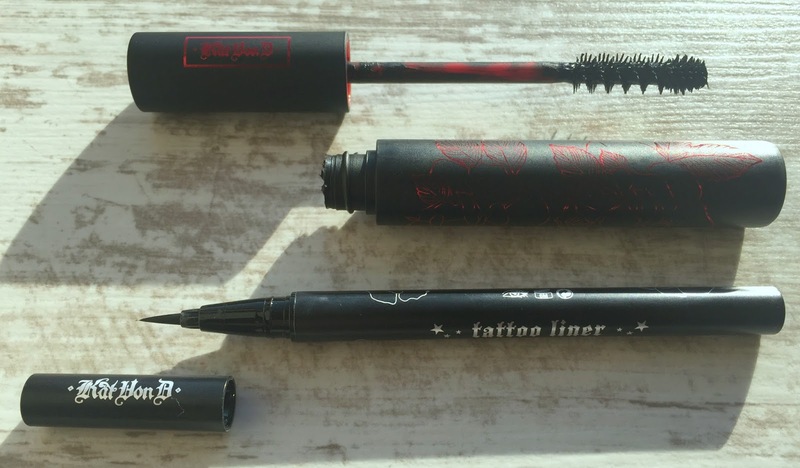 Next up are the Kat von D eye products that I have tried - from eyeshadows to mascaras to the infamous Tattoo Liner, there have been some hits and misses. To start with the positives, the eyeshadows are absolutely gorgeous, the softest, most pigmented and blendable shadows that you can imagine and some of my all time favourites. The Shade + Light Eye Contour palette is a thing of great beauty, and I'm sure we're all aware of how difficult it can be to lay your hands on decently pigmented matte eyeshadows. The swatches speak for themselves but suffice to say, if you are into your warm toned matte eyeshadows, this needs to go on your shopping list. I love how easy this is to use, how the colours are divided into three quads to help you along with your eye looks. 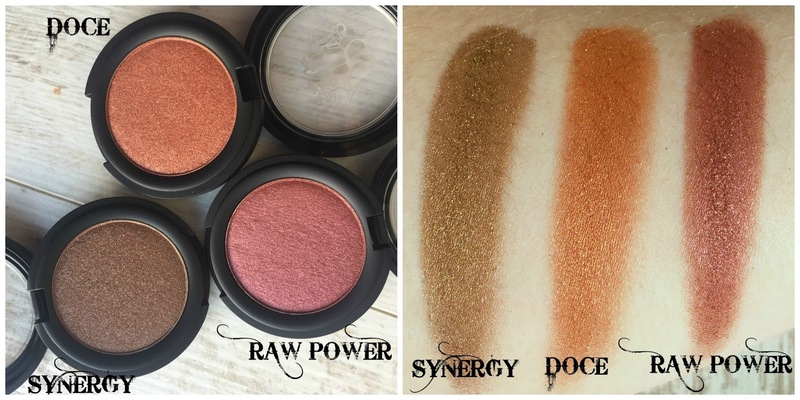 When I was in the US last year, I picked up some of the Metal Crush Eyeshadows in the most gorgeous Autumnal colours - these are highly pigmented and, unlike the Makeup Geek Foiled Eyeshadows, are long wearing. Synergy is a bronze shade, Raw Power is a deep ruby red and Doce is an orange. These are so incredibly soft that there quite a bit of fallout (and wastage - boo hiss) when you swirl your brush into them the product just crumbles in the pan. They translate beautifully to the eyelids also. Two of my more recent purchases since Kat von D has become available from Debenhams.ie are the Shade + Light Eye Contour Quads - there are four different varieties but I got the Plum (purples) and Rust (warm browns). These, unlike the other Shade + Light palettes, come in hard plastic packaging and are quite robust and sturdy, and each palette contains four shades - a base, define, contour and highlight shade. These are similarly pigmented to the original Shade + Light Eye Palette. There is also a smoky and green version of this palette. Moving on from eyeshadows, the most famed of all Kat von D products has to be the Tattoo Waterproof Liquid Liner and I have the original black one in Trooper. I'm sorry to say that I have found this to be the most underwhelming of all Kat von D products that I have tried and I am so shocked by that because honestly this eyeliner gets massive hype. Sure - the nib of the eyeliner pen is nice, but the actual eyeliner is not that black and does not last as long as I would like. It's a grand eyeliner but nothing special and I wouldn't repurchase. Finally from the eye department is the Immortal Lash mascara and this I hated in the way I hate Benefit's They're Real - this wand absolutely burned the eyeballs off me with the spikes and even looking at this picture of it is making my eyes wince and water. There are no redeeming features - I would just avoid. Another one of Kat von D's most famed products are the Everlasting Liquid Lipsticks and with good reason. These are amongst my favourite liquid lipsticks of all time. The formula is quite thin so they don't crepe up in your lips BUT I would caution that if you are reapplying over the course of the day to remove what you already have on your lips and start again as when this formula dries down, it really dries down and the net effect of constantly reapplying this on your lips would probably be like layering a couple of layers of cement on your lips. I will definitely pick up more of these. Lastly but not leastly, Kat von D also does a range of normal lipsticks in a bullet format - the Studded Kiss lipsticks. 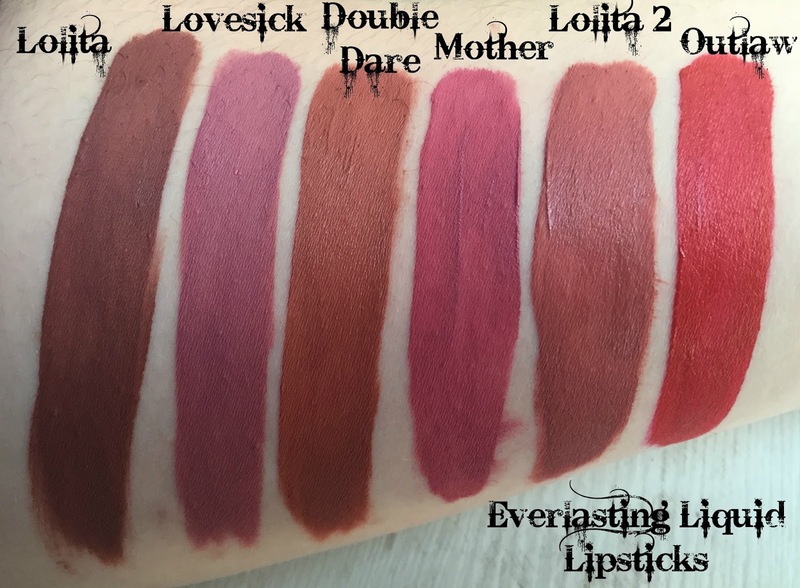 These promise long wearing colour and high performance pigment, and they're grand lipsticks, but they don't hold a candle to the Everlasting Liquid Lipsticks. 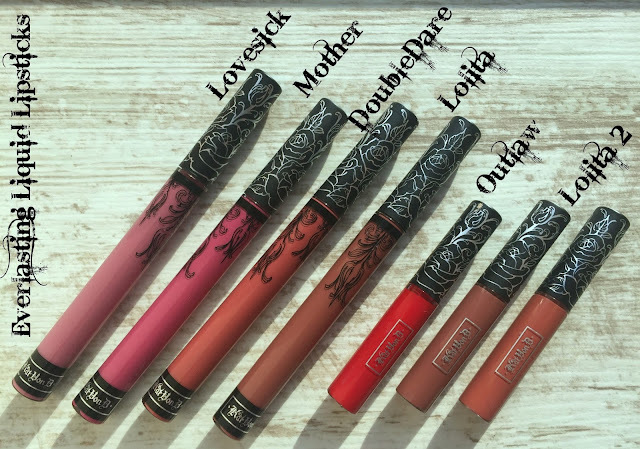 That's just a brief whistlestop tour of my Kat von D collection to date and I hope it will help those of you who are not yet familiar with the brand to make some educated purchases from Debenhams if you are so inclined. My top recommendations are the Everlasting Liquid Lipsticks, the Shade + Light Contour and Eye Contour Palettes, the Lock-It Concealer Creme - I think all of these are must haves from the line. Kat von D is available online from the Debenhams website now and the line won't be available in stores for another year or so. Tell me what's on your Kat von D wishlist? Do you have any recommendations for me?